Every Friday night, in every Jewish home, a platter of roast chicken appears on the table and the cholent can be heard bubbling in the crockpot. We take it for granted. It always was and it always will be. Until one week when it isn’t. No mouth-watering aromas emanating from the kitchen. No frantic calls of, “Put away the game right now and set the table. 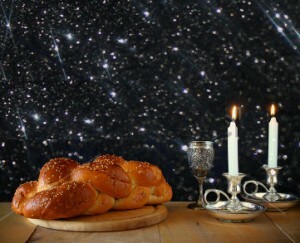 Shabbos is in eight minutes!” No Mommy standing quietly by the flickering candles, praying for those she loves. Where is Mommy? The mainstay of the home? The creator of the Shabbos atmosphere? Mommy is in the hospital, undergoing chemo. And even though the clock reads past the time for sunset, Shabbos, as the family knows it, had not yet entered their home. Grandma lives miles away in California and Abba, utterly devastated by recent events, is hardly functioning. Ten-year-old Chavi spreads peanut butter on bread to feed herself and her siblings. There are too many homes like this—those that haven’t yet been put on the Ezer Mizion list. Sometimes, it‘s Mommy who is ill. Sometimes Mommy is spending Shabbos at the hospital with a tiny child or perhaps with her husband, whispering t’hillim for hours and praying that her children should have a father. A home-cooked Shabbos meal, attractively presented for the family. A warm, sympathetic arm around the thin shoulders of the too-young teenager, trying to hold the home together. A smaller package delivered to a terrified family member spending Shabbos at a hospital bedside. The comforting feeling that someone understands and cares. The supportive crutch of knowing that the angel delivering the meal will return next week. All this is available to those on the List. But because so many are not yet on the List, Ezer Mizion has issued a call for more volunteers in Israel, especially in Bnai Brak. Volunteers are matched to families based on preferred kashrus certification, cuisine and location. Each volunteer prepares one meal per month for one family which is picked up by Ezer Mizion and delivered to the families by other trained volunteers. We Jews are characterized by our desire to give. The call has gone out throughout Israel. A good response is certain. New homes will soon be added to Ezer Mizion’s list. The meals cannot cure the cancer but they will help to encourage the family in its battle for life. Next Next post: The Golden Age?